1. 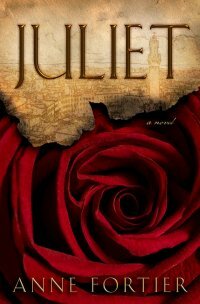 Juliet is such an intriguing and fascinating story! Were you similar to Julie in her fascination with Romeo and Juliet at an early age? I can`t boast a similar childhood fascination with Shakespeare`s play, and I certainly did not magically know it by heart! However, my mother and I did travel to Verona a great deal, and every time we went, we had to visit Juliet`s balcony and grave. I even have a little souvenir statue with Romeo and Juliet engaged in a romantic embrace, which has always been a special treasure of mine. But I did not actually read the play until high school, and to be completely honest, it didn`t grab me right away – probably because it was a Danish translation, and because I just wasn`t mature enough to identify with the characters. 2. What first sparked your idea for Juliet? It was actually my fascination with the city of Siena that first inspired me to set a novel there. Only later did I realize – thanks to my mother`s research – that Siena had been the setting for the very first version of the Romeo and Juliet-story, and so of course, as soon as I discovered that, I knew I had my plot. 3. Juliet was like reading two books in one. Did you always have the idea that you would write it that way when you began? Originally I thought it would be primarily a present-day story, in which Julie Jacobs would then reconstruct the story of Romeo and Giulietta from a scattering of personal letters and fragmented short stories, which I would then insert in their original form. However, I soon realized that it would become a much better read if I turned the events of 1340 into a narrative as well. And as soon as I gave life to Friar Lorenzo and the highway bandits, all the rest of the characters sprang to life as well – Giulietta, Romeo, and Maestro Ambrogio … almost as if they had been waiting backstage, fully formed, hoping I would let them act out their own story. 4. The research that must have gone into Juliet astounds me. Was there any particular detail or details that you uncovered that surprised you? I have to say that I was quite shocked by what I read about the Black Death, which swept through Europe in the year 1348. Even though I remember learning about it in school, it is both horrifying and heartbreaking to read eyewitness accounts, and I have to say that the chapter in JULIET about the plague and the boy Romanino was very difficult to write. Even now I choke up a little when I read through some of those passages, because I am reminded of the real people whose accounts I have read, and whose experiences are reflected in that chapter. 5. I thought Juliet would make a fantastic movie or mini series and after a little digging, I discovered it's been optioned! That's fabulous! Have you entertained any thoughts about which actors you would love to see play the lead roles? I am a little torn about the Julie Jacobs-character, because I know that my readers have so many different impressions of her. Some see her as a blonde, some are convinced she is a brunette, and so forth. But to me, someone like Anne Hathaway would come quite close to my own idea of Julie, even though, I have to say, I could also imagine Scarlett Johansson in the role. As for Alessandro, I actually wrote the book with a particular actor in mind, namely Italian Raoul Bova, who is a big star in Italy, but less known in the US, although he did play the male lead in “Alien Vs. Predator”. As for Umberto, I think Andy Garcia would be fantastic, and obviously, Sophia Loren is my inspiration for Eva Maria Salimbeni. With regards to the 1340-narrative, in my ideal world it would be shot in Italian with an all-Italian cast, but we shall see! Read our 5 Star review of Juliet.